All deliveries and services offered through www.weinbaule.de and www.weinbaule.com are distributed exclusively based on the following terms and conditions (GTC), which we will provide on request in paper form. Deviations from these terms shall apply only if these are confirmed written by us. The offers on our website represent a non-call, to order goods from us. By using our order form, you give an offer to conclude a purchase contract. The purchase contract is valid only after receiving our order confirmation via email. Our offers are not binding and subject to availability. Since some wines are only available in very limited quantity, we also reserve the right to limit the quantities before dispensing. The descriptions of the wines are only a subjective impression of our wine tasters and make no representations or warranty of any kind, dar. Minor deviations from the product specifications as approved by you if they are not unreasonable. We are also entitled to provide substitute vintages. The information contained in the order confirmation, especially delivery times, are approximately. We are entitled to make partial deliveries, unless you have expressly contradicted in the order. Compensation claims for partial deliveries, late deliveries and failure to deliver sold-out wines are excluded unless we have acted intentionally or grossly negligent. 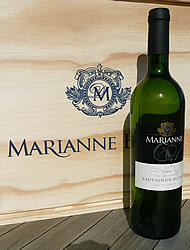 The vintages indicated in our internet shop are for information purposes only and without responsibility. Is a vintage no longer available, we reserve the right to deliver the following vintage without prior consultation, if it is equivalent in price and quality. If you do not want to get a follow-vintage delivered, please indicate this when ordering in the comment field of your order. Orders with a minimum value of 75.00 EUR will be delivered free within Germany, for orders going outside of Germany the delivery fee is 9.90 EUR, which will not be charded for order values above 150.00 EUR. For larger orders we pay the shipping costs for you. The minimum order is 30 €. You can pay by direct debit. In the event that a debit is rejected by the bank, due to circumstances that we have not represented (false statement of the account number, unsecured account), we are entitled to them to calculate the accrued bank charges. The delivered goods until complete payment property of Martin Baulmann. Only after personal consultation with Martin Baulmann is also possible to invoice the delivery. Obvious transport damage must be documented directly to you upon receipt. Non-visible damage or defects to the delivered goods are reported to us immediately once you have gained knowledge. We will then consult with you how to proceed in accordance with statutory provisions (replacement, repair, reduction of the purchase price or rescind the contract of sale).
) by a clear statement (eg, consigned by post letter, fax email) about your decision to withdraw from this contract. You can sure use the attached model form which is not mandatory. To observe the revocation period it is sufficient to send off the revocation before the withdrawal deadline. End of instructions on the right of withdrawal. In the case of an effective withdrawal, the mutually received benefits and any benefits derived (eg interest) surrendered. Can you give us the performance received and benefits (eg benefits), or not to issue or not, or only in deteriorated condition or in part, to the extent you have to pay compensation. The deterioration of the thing you have to make compensation only if the deterioration is due to a deal with the matter, beyond the consideration of the characteristics and functioning. Under consideration of the characteristics of the operation means the testing and evaluation of each product, as it is about common and possible in a store. Transportable items are to be returned at our risk. Obligations to reimburse payments must be made within 30 days. The period begins with the dispatch of the revocation or the thing for us with their receipt. By ordering you agree that we store the data received from you to process and use as part of the customer relationship. The security of your data is our top priority. Your email address will be used for advertising purposes unless you have given their express consent to this. In particular, the transfer of customer data to a third party (eg, parcel services or financial institutions) rather than solely for the purpose of contract fulfillment. If any provision of these terms and conditions in whole or partially invalid, this shall not affect the validity of the purchase contract and the remaining conditions. Only German law. Jurisdiction is Frankfurt am Main.